LAHORE: The media managers of the Punjab government have changed the nomenclature of the post of the province’s political head from ‘khadim-e-aala’ to chief minister (CM) in official advertisements. Since the day of his swearing-in, CM Shahbaz Sharif officially directed the provincial media managers to write his designation as ‘khadim-e-aala’ in all official advertisements, to create the impression that he was really a public servant. 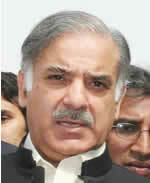 The director general public relations (DGPR) started calling Shahbaz ‘khadim-e-aala Punjab’ in all official advertisements in newspapers. The CM’s picture was not published in such appeals and promotional advertisements. Now, the DGPR has started using the official nomenclature of the Punjab CM in all advertisements published in newspapers. Sources in the Pakistan Muslim League-Nawaz (PML-N) said party workers and critics did not welcome the replacement of the nomenclature. In an appeal published in the name of Shahbaz in newspapers on Wednesday, the title ‘chief minister’ was used in place of ‘khadim-e-aala’.